...Before I forget, THANK YOU Channel 933 !!! I'm having the greatest time of my life right now and I'm so excited to see Madonna in a COUPLE HOURS!! Like I said, you can watch Madonna's performance live on MSN at 7pm. I still don't know where I'm sitting but be on the lookout for me. My outfit ..of COURSE ...is in honor of Madonna. T-shirt says "Kiss Me Mrs. Ritchie" and my belt was made by yours truly. Another picture of my "Madonna" championship belt! We're about ready to take on the day here in New York, so I will have a complete update with videos and pictures later today and this evening. By the way rumor has it that Justin Timberlake is performing with Madonna tonight AND you can see it all live on MSN.com. They're streaming the concert LIVE. So go, watch and play "where Elaine?" There was a local radio contest here in San Diego (Channel 933.) recently to win Madonna's new cd. You had to name off 4 Madonna songs in 4 minutes. I called in on Tuesday, got through and nailed that sucker with 2 seconds to spare! Not only had I won the new CD but I also was in the running for the grand prize. 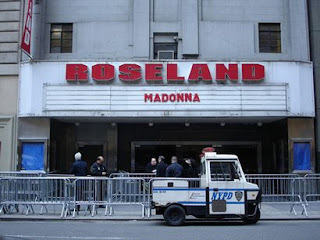 A trip for two to New York City to see Madonna perform at the Roseland Ball. I put out the good vibes and asked others to put out the good vibes in hopes that maybe, just maybe, little ol' me will be the grand prize winner. I WON!!!! My name was drawn and I'm due to fly out to New York in two weeks to see Madonna perform. I don't know when I'm leaving and how long I'm staying because I'm still waiting for the radio station to call me with the details. But I can't even begin to tell you how excited I am!!! I've never won anything this major before.. in fact I don't think I've ever even gotten through the phone lines for any radio contest! So it was meant to be. Madonna misses me and soon, we'll be having a date in New York City!!! Here I come Mrs. Ritchie!!!!! Will April 29th ever come!? Time does indeed go by slowly when you're feenin' for some new Madonna. To sorta, kinda quench your appetite, here's 30 second snippets of each song from the album. It is really just enough to aggravate my impatience. Madonna could pretty much be squatted over a hole in the ground dropping some brownies and I would still be amazed. Have I mentioned that I am completely in love with this woman?!?! Two Posts in One Day. This is NUTS. Holy Press Junket Mrs. Ritchie! You're everywhere!!! Gotta love love love when Madonna comes out with a new album. She is just everywhere!!! She's due to be on Ellen, she's on Vogue and every other magazine, radio interviews, she's going to be on Entertainment Tonight, ...tonight! and just when you thought you couldn't possibly take anymore madge...here's some sneaker video caps from her upcoming video for 4 Minutes. Interestingly enough, there appears to be "cyborgs" in this video and I'm beginning to believe Joey's theory on how the real Madonna died in a yoga accident in '98 and the Madonna we see now is actually a cyborg because she looks ridiculously hot in this video. I don't care if it is mostly botox! Botchulism never looked so good!!! Can I even say a 50 year old is hot? Well I guess if its Madonna, hell yeah I can because it's true!